Dublin sub Jack McCaffrey's late strike effectively killed off Donegal's hopes of starting their Division One campaign with back-to-back wins. Half-back McCaffrey burst forward to fire an unstoppable shot past Donegal stand-in keeper Michael Boyle. First choice keeper Paul Durcan had to go off after being injured when Cormac Costello got Dublin's early first goal. Dublin played most of the second half with 14 men after Kevin McManamon's dismissal for two yellow cards. Donegal had been level with the Dubs early in the second half but the Ulster county, who had opened their campaign with an impressive win over Derry, seemed to run out of steam. Dublin, with a much-changed team from when they lost to Donegal in last year's All-Ireland semi-final, deservedly secured their first points of the 2015 league. They got off to a great start when Michael Fitzsimons released Costello who rounded Durcan to score the first goal. Michael Murphy and Patrick McBrearty scored three points each in the first half for Donegal who trailed 1-8 to 0-7 at the interval. 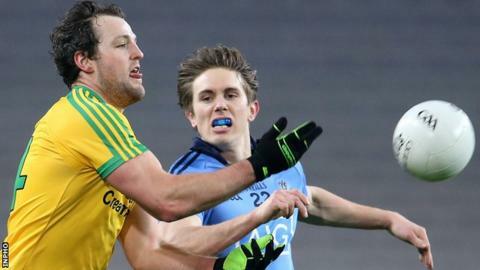 There were two points in it when McManamon was sent off following a clash with Donegal's Ryan McHugh. But frees by Dean Rock and the second goal from McCaffrey seven minutes from time saw Dublin secure victory. A late black card for skipper Murphy merely added to Donegal's frustration. Dublin scorers: Rock 0-5, McCaffrey 1-1, Costello 1-0, Byrne 0-1, E O Conghaile 0-1, O'Gara 0-1, Kilkenny 0-1. Donegal scorers: McBrearty 0-4, Murphy 0-4, Toye 0-2, McFadden 0-1.